I went to Creed reluctantly, not believing the hype about how good the film was, and certainly not wanting my working class family’s love of the original Rocky (John G. Avildsen, 1976) to be trampled into the dirt. I am delighted to report that the movie is indeed as good as people are saying it is, astonishingly so: Creed is a revelation, a movie deeply beholden it its very different 1970s progenitor, yet a far, far better piece of cinema. Creed is the best of what reboots aspire to be, visits to familiar material whose purpose it is to revitalize and transcend the original. The closest analogue I can summon for Creed is Battlestar Galactica (Sci-Fi Channel, 2003-2009), a grandiose televisual achievement, built upon an endearing yet minor original. Of course, the original Rocky was by no means a minor piece of New Hollywood cinema. Indeed, it is one of the most misunderstood artworks in academic film studies. The standard party line is that films of what critic Robin Wood calls the “Lucas-Spielberg Syndrome” in the late 1970s ruined small, personal filmmaking common to the art cinema of the 1960s. Rocky is a sore thumb in that reductionist story: based on a sparklingly raw script by Sylvester Stallone, the $1 million dollar low budget film went on to great success in both the financial and critical registers. Rocky was the top film of 1976 at the box office, grossing $117 million domestically and $200 million globally. This is, shockingly, a greater percentage payout on original investment than the film which typically defines for academics the return of the blockbuster, Jaws (1975). Steven Spielberg’s film’s production costs came in at $9 million, well over double its original budget, grossed $120 million in domestic box office, and $400 million globally, making the shark film the box office king of all time, supplanting The Godfather (1972), displaced a few years later by Star Wars (1977). But unlike Jaws, Rocky was a critical darling as well. The boxing film won the Best Picture Oscar at the 1977 Academy Awards (beating out the “movies of significance”: All the President’s Men, Network, and Taxi Driver); Jaws was nominated for Best Picture for the 1976 ceremony, but lost to One Flew Over the Cuckoo’s News, which swept all five above-the-line categories. The shark film won Oscars in only below-the-line aesthetic categories (Best Sound, Best Film Editing, and Best Music). Rocky won a second above-the-line award, Best Director for John G. Avildsen, as well as Best Film Editing. Jaws’ academic reputation was immediately tarnished by its box office success; in recent years, some scholars have come to at least appreciate Spielberg’s directorial mastery, if not the film’s weak critique of Watergate corruption, overwhelmed by its anti-feminist and jingoistic ideological positioning. However, as Jaws’ reputation recovered a bit, despite its almost universally loathed sequels, Rocky’s plummeted, even with the continued box office success of its ideologically more aggressive sequels. Rocky II (Sylvester Stallone, 1979) saw Rocky (Sylvester Stallone) finally triumph over the superior boxer and showman, Apollo Creed (Carl Weathers). In Rocky III (Sylvester Stallone, 1982), Apollo comes to the aid of his former foe to defeat angry black separatist, Clubber Lang (Mr. T). Rocky IV (Sylvester Stallone, 1985) featured evil communist Ivan Drago (Dolph Lundgren), who kills Apollo in the ring. The Rocky films develop a conventional narrative about race in the United States. Rocky offers a bitter indictment of affirmative action in 1976; white working class Rocky doesn’t have a chance in decayed Philadelphia, while Apollo is both a great showman and businessman. Rocky II sees those two positions soften, as the men come to respect each other for their boxing skills. Rocky III fully fuses their middle-class positions against the radical Lang, while Rocky IV enlists black and white against red, in an ideological battle against the Soviet Union. It is this legacy of normative, ideologically conservative race politics that Creed seeks to overcome. The film succeeds by creating as sophisticated an allegory of race in the United States as has been presented on an American film screen in quite some time. At first, it might seem odd that Creed’s director, Ryan Coogler would turn to the problematic Rocky franchise, whose central character is a white working class hero, after Fruitvale Station (2013), perhaps the most accomplished of the realist melodramas about police murders of young black men of our “Black Lives Matter” present. However, Creed is an even more sophisticated film about race in America than was the excellent Fruitvale Station. Creed concerns Adonis Johnson, played by Michael B. Jordan, who also portrayed the murdered central protagonist, Oscar Grant in Fruitvale Station. The illegitimate son of Apollo Creed, the famous boxer’s widow, Mary Anne (Phylicia Rashad) rescues Johnson from a life of fighting other kids in juvenile detention. Now a young adult, and like his father, a savvy businessperson, Adonis has just earned a promotion at his job at an investment bank. However, he has been moonlighting as a boxer in Mexico. In order to find himself, he moves from his home in Los Angeles to Philadelphia, to ask Rocky Balboa, his father’s friend, to train him to be a better boxer. Coogler’s films’ chemistries are precise in their narratological and intertextual stoichiometry. Adonis Johnson and Oscar Grant are surprisingly similar: both seek normative middle-class lives in California (at the midpoint of his film, Grant throws away the marijuana he has considered selling in order to make a living), but these lives are soon discarded. It might seem Fruitvale Station is the more radical of the films, given that Oscar’s future is destroyed by the police state. However, I think Creed is even more compelling in its allegorization of the damage racist culture does to young black men. Adonis literally wants to emerge out of his father’s shadow. In the film’s best scene, which occurs in its first ten minutes, Adonis sits in his mother’s mansion, paid for with Apollo’s boxing fortune. Using the home theater’s expensive projection system, Adonis watches on YouTube his father’s first fight with Rocky Balboa. He stands up and begins boxing, swathed in the image’s shadows. Stunningly, Adonis does not fight as Apollo, but instead as Rocky, throwing punches at his father. Adonis is at war with his black father, both literally and figuratively. The fact that Apollo Creed was the greatest fictional boxer of all time—from the first Rocky film onward, he is a kind of comic doppleganger of Muhammad Ali, shorn of the real man’s radicalism—is of little consolation to Adonis. As the illegitimate progeny of the great man, Adonis cannot function in contemporary America. He turns, of all places, to a white working class Italian-American, from a community not particularly well known for their progressive approaches to African-Americans. As Noel Ignatiev and other whiteness studies scholars have emphasized for decades, American racism was built in the 19th century by assimilating white working class immigrant communities (the Italians and the Irish in particular) at the expense of African-American people. Cornel West’s position is that, to defeat right-wing racism, black and white working class people need to overcome their differences and embrace their far more significant commonalities. This is the message that Creed delivers. Adonis comes to know his father through Rocky Balboa, the great white hope who in another register is the unequivocal enemy of all black boxers throughout history, from Jack Johnson to Mike Tyson. Creed is a masterpiece of intertextuality, taking faint echoes of the original Rocky films and re-purposing them to tell Adonis’ story. 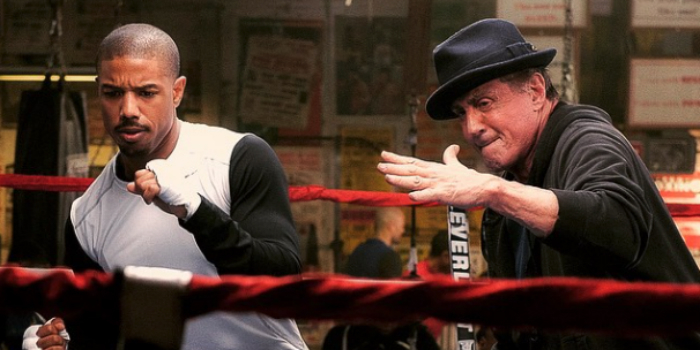 Creed’s beautifully subtle musical score quotes the iconic tunes from the sterling Rocky soundtrack: Bill Conti’s fabulous, “Rocky’s Theme” as well as Deetta Little’s “You Take My Heart Away” (when Rocky goes to visit Paulie’s and Adrian’s graves). Adonis visits Rocky’s statue, a real public artwork created for Rocky III at the top of the granite steps that lead to the Philadelphia Museum of Art, but so beloved by Philadelphians that it remains on the grounds to this day. Adonis watches the films of Apollo’s fights with Rocky, just as Apollo did with his trainers in Rocky II to figure out how to win with conviction over the slugger. Rocky channels his great trainer, Mick (Burgess Meredith)–who increased the big galoot’s speed by having him chase a chicken–by training Adonis in the same way, the funniest scene in Creed. Rocky famously ran through the streets of Philadelphia, spurred on in his training by the Italian-American kids in his neighborhood running behind him; Adonis triumphs in front of the ailing Rocky Balboa’s house, similarly buoyed by kids in the neighborhood riding their motorbikes around him. A new song, infused by rap and hip-hop, replaces Conti’s “Gonna Fly Now” on the soundtrack, but the transformation only furthers Creed’s connections to the original Rocky. Finally, as the beautifully shot climactic bout approaches, Rocky gives Adonis his father’s bicentennial boxing trunks. In the original film, these red, white and blue shorts served as the centerpiece of Apollo’s colonial mimicry, updating George Washington crossing the Delaware via the bought with Rocky, to establish the strength of the African-American presence in late 20th century Philadelphia. Rocky has had stitched two names on the pants, Johnson in the back, Creed in the front. These trunks complete Creed’s allegory: Adonis, whose first name has always carried the Delphic connection to Apollo, now puts his generic name, associated with 19th century slavers giving African-American people their European names, behind him. Adonis’ future belongs not only to his father’s legacy, but he will live his life axiomatically, dedicated to a one word slogan that captures the fusion of the cunning values of Apollo and the grittiness of Rocky. His creed is that which America must embrace if it its to find its way into the future.